Over the last week we have started to feel a little unsettled as we realised our time in Scotland was coming to a close – what should we do for our last few days to make the most of our remaining time? How would we feel to leave the land of square sausage and well fired breakfast rolls? We toyed with a trip into Edinburgh but I wasn’t too keen, much as I love the city I also spent plenty of time there with work and couldn’t quite separate the city from the memories of clip clopping up and down the hilly streets in my work clobber dragging my little wheely suitcase with me. So the answer was that we would spend a couple of days on the ‘golf coast’ seeing a very small selection of what this south eastern stretch of Scotland had to offer. We started in North Berwick, a gentrified town on the coast within commuting distance of Edinburgh with a long seafront beach and a skyline dominated by two ancient steep sided volcanic plugs; out to sea is Bass rock, home to the largest gannet colony in the world, inland is Berwick Law, topped with a (now replica) whale’s jaw bone. 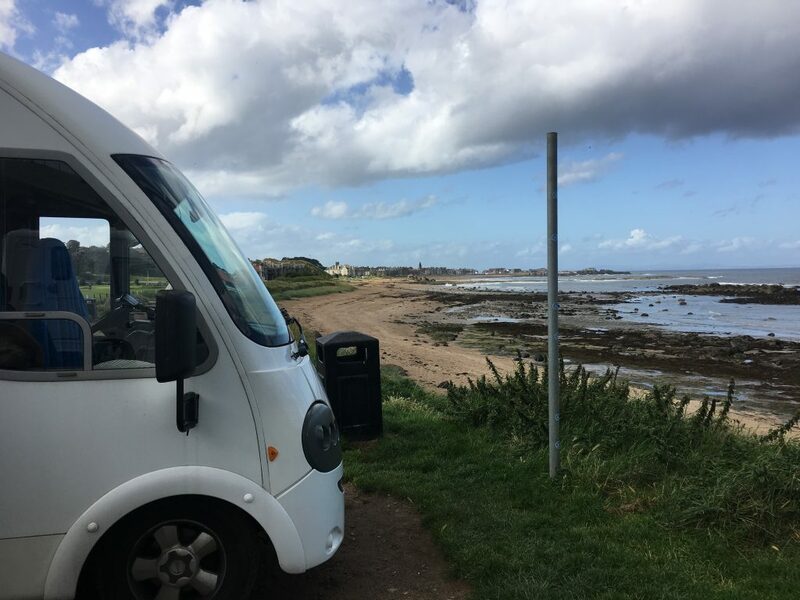 In North Berwick we spent the night in a popular spot on the eastern end of the seafront, with several other motorhomes and campervans. 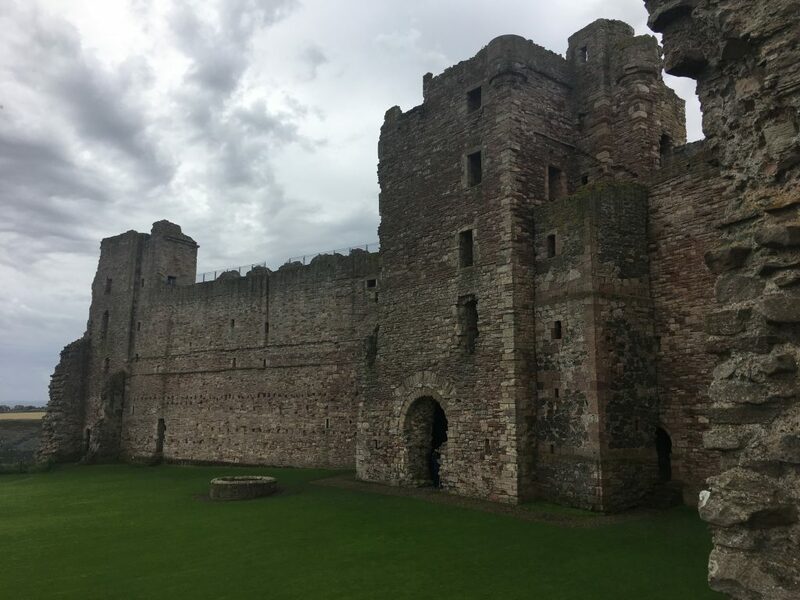 The following morning we walked along the coast to Tantallon castle, an interesting ruined castle with a large curtain wall protecting it’s inland side and sea cliffs forming the main defence around it’s other three sides. The coastal walk was tough going as the paths slowly petered out and we had to fight our way through scrub to finish the walk. On the way back we mainly walked along the road! During our walk we watched the many seabirds, mostly gulls and gannets, that were flying backwards and forwards along the coast and out to sea. Through our binoculars we could see the castle and lighthouse on Bass Rock clinging to the sides of the guano draped island. It was difficult to imagine anyone being able to land on the island with it’s steep sides, let alone making their way up the cliffs to the buildings. The island sports no greenery and very few flat surfaces so anyone in those buildings would have been trapped until a boat could come out to collect them, a grim place to get stuck! After North Berwick we moved onto Eyemouth, a contrast to North Berwick, Eyemouth is a working fishing town with ship building, fisheries and a fish market. We took a walk round the harbour and watched as boats left on the rising tide and then stopped at The Contented Sole for a couple of drinks. Near our parking spot was a memorial to the Eyemouth Fishing Disaster of 1881, where 189 fishermen lost their lives, including 129 from the town itself, an event that must have overshadowed the town for many years after it happened with so many wives and children left to grieve. We’d had a couple of pleasant days, but the following morning dawned grey and gloomy and our moods were the same as we realised we would be leaving Scotland. Country Summary – Scotland, the most beautiful place in the world?